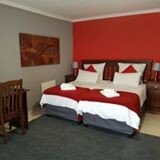 Ehrlich Park Lodge is a 3-Star tourism/hospitality establishment, which caters to all types of tourists/guests. We are open 24/7 and we assure you service excellence throughout our facilities. We are conveniently situated in a peacefull/tranquil suburb, Ehrlich Park. Our location is within close proximity to a mini shop, supermarket, butchery, post office, petrol stations and the main road. Our rooms are fully furnished and distinctively decorated. We serve all meals(including special dietary needs). We also have a braai-area, a lounge and we host special events for small groups.